Mon-Fri 7AM-5PM. Built in 1884 by Oscar LeJeune and presently operated by Matthew LeJeune, 5th generation of the LeJeune family. Listed in the National Register of Historic Places. Free tours are given by appointment. 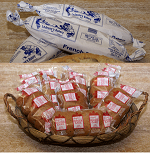 Products are LeJeune's French bread and ginger cakes.